100 Baht type 1 yellow offset at the middle, double outline alphabet watermark, serial number run from D1 00001. 100 Baht type 2 change yellow offset area to yellow microtext "HUNDRED TICALS", serial number run from D1 65001. 100 Baht type 3 change the color from yellow to brown and change alphabet watermark from double outline to single line, serial number run from D2 50001. 100 Baht type 4 add serial numbers under signatures, serial number run from D3 50001. 100 Baht type 5 change the frame color from dark brown to light purple, serial number run from D4 00001. Type 2 ordinary number signatures Suriya-Suwan VF about 165,000 - 173,000 baht. Type 3 ordinary number signatures Kitiya-Mahas VF about 230,000 - 242,000 baht. Type 4 ordinary number signatures Kittiya-Manas VG about 39,000 - 41,000 baht. Type 5 ordinary number signatures Supayok-Thep UNC about 177,600 - 186,000 baht. Type 5 ordinary number signatures Supayok-Thep VG about 38,000 - 40,000 baht. The 100 Baht 1st series Thai banknotes were produced by Thomas de la Rue and printed only one side with flat ink as called uniface banknote. There were 5 types with little adjustment in details. 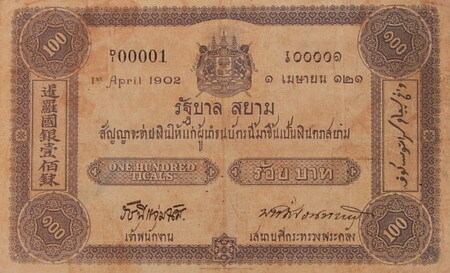 100 Baht type 1 banknotes were announced on 7th September 1903. 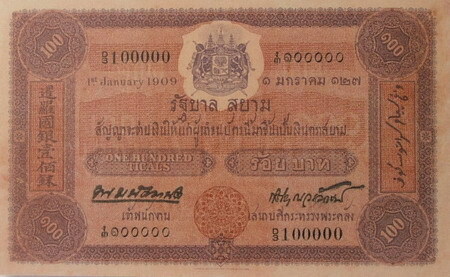 100 Baht type 2 banknotes were announced on 16th January 1904. 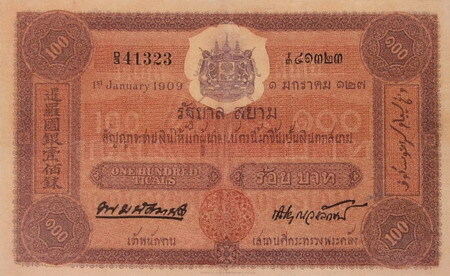 100 Baht type 3 banknotes were announced on 1st January 1910. 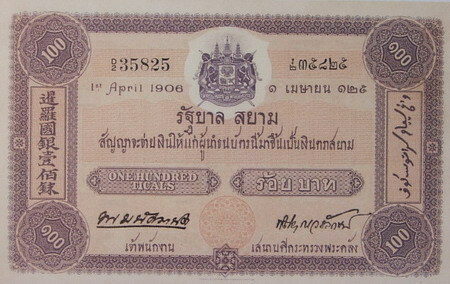 100 Baht type 4 banknotes were announced on 14th January 1914. 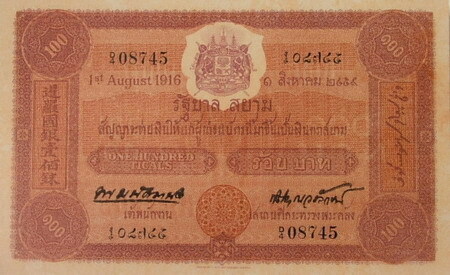 100 Baht type 5 banknotes were announced on 10th August 1917. Type 1 starts from D1 00001. Type 2 starts from D1 65001. Type 3 starts from D2 50001. Type 4 starts from D3 50001. Type 5 starts from D4 00001.